Dr Parry, one of the most famous of all Welsh composers, is buried in the churchyard at St. Augustine's. He became the first Professor of Music at the University College of Wales (Aberystwyth), later establishing a private school of music in Swansea and finally becoming a lecturer in music at the University College of South Wales and Monmouthshire in Cardiff. His compositions found much favour in his lifetime both in Britain and the USA. Two of his most famous compositions are the part-song "Myfanwy" for male voices and the hymn tune "Aberystwyth". He also wrote chamber and orchestral music but most of his work is choral or dramatic. His opera "Blodwen" is believed to be the first Welsh opera. LOCATION - The grave is in the North East section of the churchyard. From the West door of the church, walk around the church, follow the path eastwards to where it bends and the grave is about 10 yards ahead, just to the left, under a cherry tree. 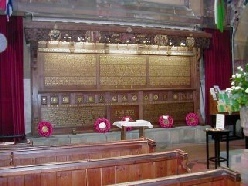 THE ROLL OF HONOUR was completed in 1920 and designed by John D Batten. It is carved in Italian walnut and consists of a canopy of fruit and foliage overhanging three panels with the names of the 200 Penarth men who died in ‘The Great War’. Below the panels are the gilded names of the main battles of the war and regimental badges in colour. 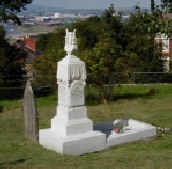 It has recently been restored and reguilded and research has been done into those commemorated on it. A book is available on its history. 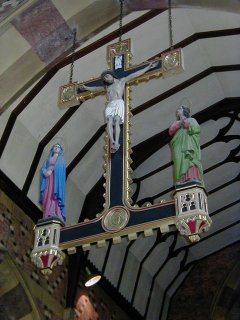 The Churchyard Cross, which now stands inside the church on the left of the Lady Chapel altar, is a medieval relic but is badly weathered so that only the Crucifixion scene is recognizable today on one of its faces.